Save 30-50% over resort prices. Rent directly from Sundial K405 owner and get the exact condo you see here! Our Two Bedroom Grande Beachfront Residence, less than 25 feet from beach with direct sweeping views of the Gulf of Mexico from virtually every room. The condo provides 1,500+ sq.ft. Full kitchen complete with housewares, 2 private bedrooms, 2 baths, living/dining room + adjacent den. Den has a queen-size Murphy Bed and sofa, and can be closed off to become a third bedroom. Comfortably accommodates up to six guests. Two FREE adult bikes, FREE WiFi, + Washer/Dryer in unit, 4 flat screen TVs, 2 DVDs, King-size bed in MBR, twin beds in BR #2. Large and bright living room has sliding glass doors to screened lanai less than 25 feet from the white, sandy beach. Rentals are 7 night minimum and are on a Saturday to Saturday basis. We will consider exceptions, however, they must fall within our rental period. Please note: Our Sundial E104 and K405 condos are private rentals (not rented through the resort). For more details of all of our extras, please scroll down to the "other amenities" section. Our Direct Gulf Front Sundial Condo offers a luxurious vacation at a reduced rate. Included: 2 FREE adult bikes, beach and lounge chairs, sun umbrellas, pool noodles, pool towels, sand toys and high-speed internet. Additional FREE amenities at our complex include: Beach Front Heated Pool with Lounge Chairs and Umbrellas, 5 Gas BBQ Grills and Shuffleboard. Although we are not affiliated with Sundial Beach Resort & Spa next door, they offer public amenities our guests can use: (user fees may apply) HydroGrid® Tennis Courts, Bailey’s Market & Deli, Restaurants and Poolside Bar, Kate Casperson’s Spa and Sanibel Sea School. Other amenities at the resort are private. We had an incredible view of oceanfront beauty. The condo was spacious and had all the amenities for a fantastic stay. We really appreciated all of the beach chairs, umbrellas, bikes etc. We loved K405. It was roomy, comfortable, and the location was great on Sanibel Island. We loved the screened lanai, and the nice supply of chairs, umbrellas, and water toys in store room. I loved walking along the beach early every morning and checking out the fish that people were catching, and looking for shells. We found lots of Calico scallop shells, sand dollars, and some Florida fighting conch shells, to name a few shell types. We cooked 4 of the 7 nights and ate at the Island Cow, The Bubble Room, and at Doc Fords. All were good but Doc Fords had our favorite entrees and the Bubble Room had our favorite desserts. We went on a shelling excursion to an island off of North Captiva, and it was heartbreaking to see so many dead fish and eels that were victims of red tide. We were lucky that our beach didn't seem to be affected by red tide while we were there. On our first evening there, the water was crystal clear, and at low tide we saw so many of the large starfish and live sand dollars. We had fun viewing them but did not take anything that was alive from the gulf. We had a great time on beach and exploring the Ding Darling Wildlife Refuge. My favorite birds were the Roseate spoonbills, but loved all of birds and wildlife including the tree climbing crabs. WE HAD A GREAT TIME IN THIS CONDO WITH A LOT OF EXTRAS. MARJORIE GOT BACK TO ME EXTREMELY QUICKLY WHEN I HAD QUESTIONS. VERY NICE OPEN CONDO WITH MORE THAN ENOUGH ROOM FOR MY FAMILY OF 4. BIKES, GAMES, MOVIES, POOL ITEMS, BEACH CHAIRS, UMBRELLAS AND AWESOME VIEWS OF THE OCEAN. SAW DOLPHINS MORNING AND NIGHT. THANKFULLY WE HAD ALL THIS BECAUSE WE WERE THERE WHILE TROPICAL STORM ALBERTO WAS AFFECTING SANIBEL ISLAND WITH HIGH WINDS AND LARGE WAVES - BEAUTIFUL TO WATCH FROM THE LANAI! WOULD DEFINITELY STAY HERE AGAIN. 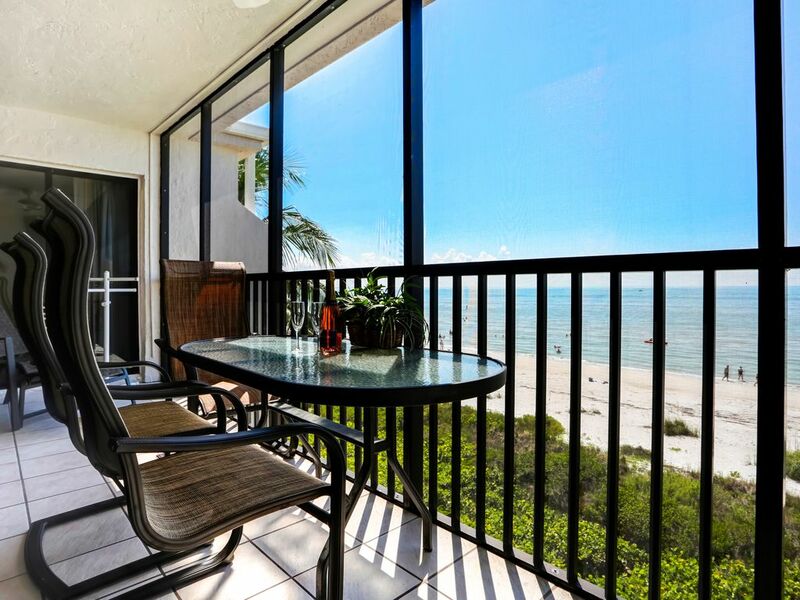 This condo has everything you need and want for a week at the beach. Bikes were in great shape and the utility closet has all the toys and chairs and umbrellas to make your beach days a blast. Wish we could've stayed forever! We stayed for a week in April and the Condo has everything we needed including bikes (2). This is the most bike friendly place I’ve ever been and it was nice to have that as an option. It was wonderful to have a washer and dryer right in the unit so we actually went home w clean clothes rather than having to do them all when we got home. Marjory provided every amenity that I could imagine and some I hadn’t even thought of. The master king was very comfortable and the view was gorgeous. The room with the twin beds got a little stuffy, but when they left the door open and the fan on for air flow it was quite pleasant. The directions provided to pick up keys after hours could not have been easier to follow. It really was a spectacular and comfortable place. The living room furniture was comfortable and we spent hours listening to the waves on the balcony. Great family vacation with something for everyone! Fantastic view and location. The owner was there when I had a question and the property was as advertised. Loved the bikes to ride around the island. Highly recommend!